The "grandmother of all agitators" originally hailed from Cork, Ireland. A friend recently posted a picture of Mother Jones, the famous labor leader, online. I reminded her that this most famous of women defenders of workers was herself an immigrant. 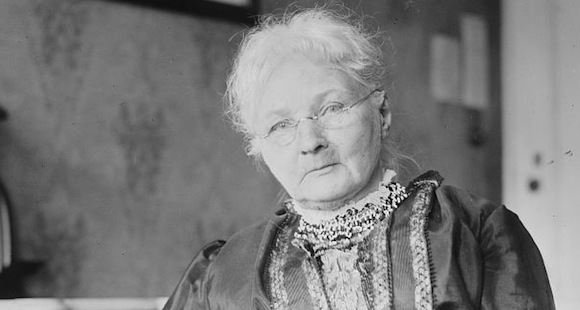 You may know the magazine named after her, but what do you know of Mother Mary Harris Jones? 20 bodies were buried this morning, and they were fortunate in getting buried at all. The people build themselves up in their cabins, so that they may die together with their children and not be seen by passers-by. Fever, dysentery, and starvation stare you in the face everywhere. In 1847, at the height of the Famine, Mary’s father sailed for America. He got work in Vermont first. He then moved to Canada to work as a railway laborer and teenaged Mary joined him there after having endured the Great Hunger of the late 1840s in Ireland which claimed a fifth of the population. Although Mary Harris was poor, her illiterate parents placed a strong emphasis on education. Rather than putting their children out to work to support the struggling family, Mary was sent to a teacher’s college and her brother entered a Catholic seminary. He became a priest and her first job was teaching at a Catholic school. The Catholic school was in Michigan, and so, at the age of 23 she immigrated again. On the eve of the Civil War, she headed to Memphis to take another teaching job and when Tennessee seceded the following year, 1861, she found herself in yet a fourth county, the rebel Confederacy. Hellraising immigrants like Mother Jones made America a better place for everyone.